Gerard Valcin was born in Port-au-Prince in 1925. As a young man he was a tile setter, a trade that influenced his art, as is evidenced by his symmetrical placement of figures, blades of grass or trees in many of his paintings. He joined the Centre d’Art in 1950, and is one of the sacred monsters of Haitian Art, an icon. 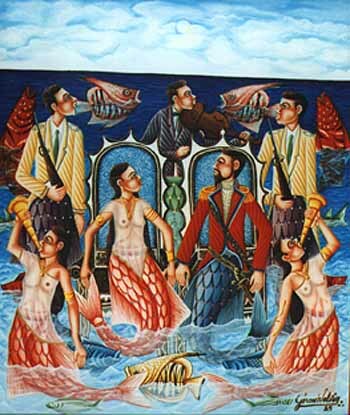 His work is frequently concerned with vodou imagery. He is the half-brother of the artist Pierre-Joseph Valcin and the uncle of Favrange Valcin, who paints under the name ValcinII. Several artists, including Madsen Mompremier, Dieudonne Rouanez, and Louis Joseph, have studied with him. Gerard Valcin died on May 15, 1988.
excellent catalog of the same name. 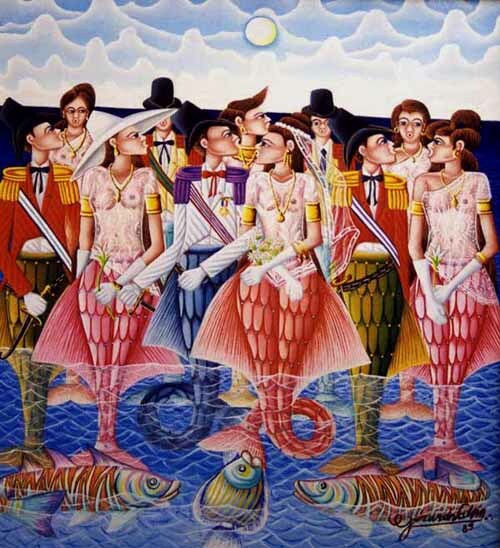 "The Marriage of Agoue & La Sirene"
* The painting is accompanied by a letter of authenticity stating provenence.